Azeem Hopkins-Bey, grand sheik of the Moorish Science Temple Number 11, in Philadelphia, speaks during the annual observation of Moorish-American Remembrance Day on Independence Hall. 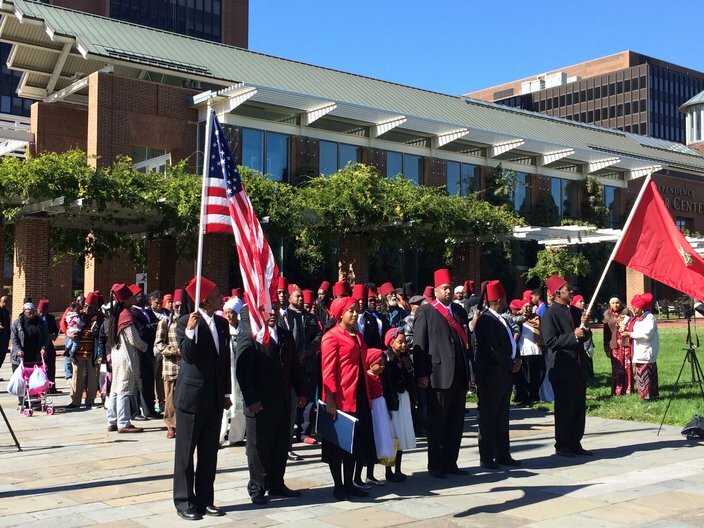 About a hundred Moorish-Americans from across the country gathered on Independence Mall on Friday to remember the first generation of Moors who were stripped of their nationality and birthrights in colonial Philadelphia. "We are paying respects to our ancestors who were mislabeled as black," said Azeem Hopkins-Bey, grand sheik of the Moorish Science Temple in North Philadelphia. "'Black,' that's a slave term." Hopkins-Bey said that in 1774, the First Continental Congress "erased" the heritage of those who were brought to America as slaves, by considering them all to be "blacks" and thereby erasing the identity of the men and women who suffered and died as slaves. "Once you lose your heritage, you lose your culture," he said. "Then, you're looked at with a stereotypical eye." Moorish-American Remembrance Day is a unique gathering intended to allow Moorish-Americans to remember that heritage and preserve their own identity. 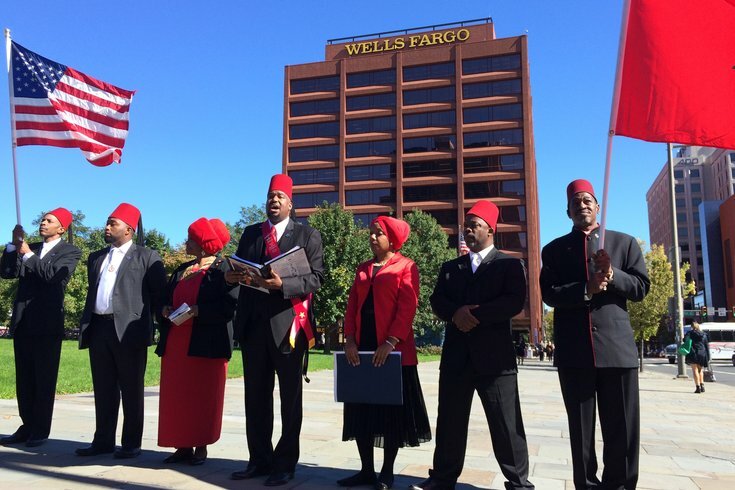 Members of the temple – who consider themselves Moorish by nationality and practice Islam — gathered in Old City for a reading of the city's proclamation noting Oct. 14 as Moorish-American Remembrance Day in Philadelphia, before they toured Independence Hall and Carpenters' Hall. The event would end in a feast. Hopkins-Bey said the day was also a time to remember those who died in the bonds of slavery. Not just in somber remembrance, said Sharif Anael-Bey, 49, of Syracuse, N.Y., but to celebrate Moorish-Americans' rediscovery of their identity, and their embrace and celebration of that heritage. "This is a day of celebration because we are in possession of our identity that has been taken away," he said. During the afternoon gathering, children ran and played in the grass, while women and men wearing cultural garments and red headpieces — women in scarfs, men in traditional fezzes — joked and chatted, all seemingly excited to be together on a sunny, autumn afternoon. Before the group began their tour, Ronald Hopkins-Bey discussed the importance of the holiday. Moorish-Americans march down Market Street along Independence Mall, during Moorish-American Remembrance Day on Oct. 14. "There has been a lot of American history that has been forgotten," he said. "We are all Americans... We are right here in America. We are Moorish Americans." Ronald Hopkins-Bey said that the terms "black" or even "African American" are tied to slavery in negative ways. He said this terminology forgets the Moorish heritage of these Americans. "This is what our people suffer from," he said. "We need to get back to our nationality, culture and traditions. "When Jewish people came out of slavery, they were still called Jewish. When Japanese people came out of slavery, they were Japanese," he noted. "But when the Moors went in to slavery, they came out as African-American. Slavery is bad, yes, but this is something else... When you take away a man's nationality, you take away his heritage." The event also seeks to celebrate humanity as one species, instead of separating people by the color of their skin. "You don't identify someone by color. You identify by race," said Hopkins-Bey. "And there is only one race, the human race, that's it." As he moved off to join a tour with the rest of the revelers, he turned to offer a final comment. "Remember, humans can't be colors," he said.